North Lochsa Slope Click on the image to enlarge and zoom in. 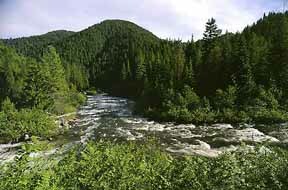 Fish – Hungery Creek Roadless Area is 118,000 acres of natural beauty located entirely within the boundary of the Nez Perce – Clearwater National Forests, about 70 miles east of Lewiston, Idaho. U.S. Highway 12 provides access from the south, and a few other low-standard dirt roads allow alternative entry, with the Lolo Trail/Motorway forming the northern boundary. Nestled between Weitas Creek, Rackliff-Gedney, and Lochsa Face Roadless Areas, and the Selway – Bitteroot Wilderness, this country is characterized by its two major types of drainages: the first, a series of one-to six-mile long streams like Glade, Apgar, Deadman, and Bimerick Creeks that drain directly into the Lochsa River. The southwest and northeast portions of these are distinguished by steep stream breaklands dissected by abrupt side drainages. The second type, represented in the central portion of Upper Bimerick and Fish Creek drainages, exhibit a more broken topography: moderate-relief uplands and gentle hills etched with meandering streams spilling into broad bottomlands with diverse vegetation. Here, in the 60,000 acre Fish Creek drainage, the explorer is generously afforded a sense of solitude and isolation from other human activity in the most important steelhead stream in Idaho. Lush, shaded banks create a vital haven for anadromous steelhead trout and Chinook summer salmon, as well as cutthroat and rainbow trout. Elk are provided essential summer range in the Fish Creek drainage, and the area as a whole nurtures nearly 18,000 acres of ungulate winter range. Mule and white-tailed deer, moose, mountain goats, cougars, black bears, fisher, pine marten, wolverine, and lynx are among the mammal denizens, and Region 1 sensitive bird and amphibian species are present. Elevation ranges from about 1,500 feet along the Lochsa River to 6,600 feet at Castle Butte to the northeast. At the higher elevations lodgepole pine, subalpine fir, and beargrass are common. Western red cedar and grand fir grace the north slopes. Large forest fires in the early 1900s greatly determined later growth: a mosaic of expansive brush fields span many of the slopes, especially those in the south and west, but give way to concentrations of western white pine, Douglas fir, Engelmann spruce, larch, ponderosa pine, and mountain hemlock. Furthermore, Fish – Hungery boasts several sensitive plant species including clustered ladyslipper, evergreen kittentail, Constance’s bittercress, broad-fruit mariposa, light hookeria, and bank monkeyflower. 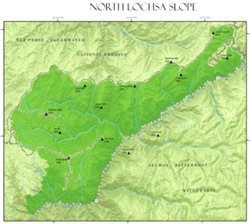 The 1,300-acre Lochsa Research Natural Area was established in 1977 to protect and study the unique Pacific Coast vegetation that occurs within the roadless area boundaries. Flowering dogwood and 14 other plant species that are not normally found east of the Cascade Mountains or further east in the continental U.S. grow in this Research Natural Area. An approximated .25 mile wide corridor within the Wild & Scenic Middle Fork/Lochsa River, runs the full length of the roadless area north of Highway 12. The 4,500 acre corridor is specially managed to emphasize the scenic values of the river environment. A sparse network of minimally maintained trails weaves throughout the area, most constructed in the early 20th century by Forest Service for wildfire control access. One path runs parallel to Fish Creek, offering low-impact accessibility to its cool, alluring waters. Stream fishing, hiking, backpacking, and horseback riding are becoming more popular as visitors can disperse widely throughout this country, from the mossy streambeds to the steep breaklands showcasing panoramic vistas of the Selway – Bitterroot Wilderness. The Lolo Trail is an important prehistoric route and prominent in Nez Perce cultural and history. This area possesses the longest remaining undisturbed section of the Lewis & Clark Trail in the country. Some 17 miles of trail in the Hungery Creek drainage, aptly named as the place where the explorers had nothing to eat, remains much as Lewis & Clark found them. In addition to a number of other historic and prehistoric sites, another of note is a World War II Japanese – American Internment camp near Highway 12 to the south just outside the boundary. Under the Clearwater National Forest Travel Plan (2012), the region is now open to ORVs and ATVs, a guaranteed menace to natural processes and healthy ecosystems. Areas to the west and east have already been developed for timber harvest. The wealth and diversity of the region’s flora and fauna cannot afford encroachment of roads and further exploitation. Its wilderness attributes and spatial orientation make it an ideal wilderness candidate.